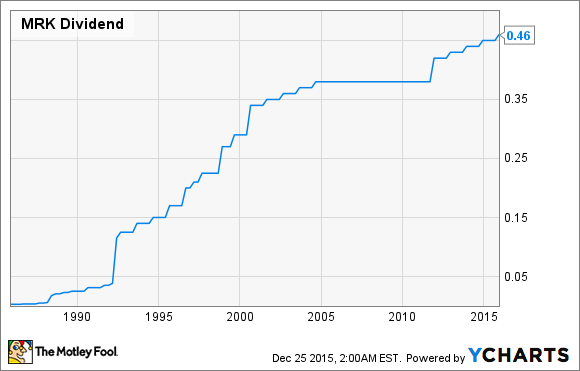 Will Merck & Co. Inc. Raise Its Dividend in 2016? Already sporting a superior dividend, can pharma giant Merck deliver an even juicier payout to shareholders in 2016? The broad-market indexes may be relatively flat for the year, but shareholders of pharmaceutical juggernaut Merck (NYSE:MRK) would just as soon kiss 2015 goodbye. As we saw last week, Merck's had quite a few exciting headlines in 2015 that could give investors plenty to look forward to in 2016 and beyond. Nonetheless, shares of Merck have declined in 2015 by more than 6% through the Christmas Day holiday. Merck investors expect the company to address a host of issues in 2016 and beyond, such as how it'll reignite growth after the loss of exclusivity on previous blockbuster Singulair, a treatment for asthma, and whether or not its acquisition strategy, which involves bolting on complimentary product and pipeline portfolios, will pay off. Will Merck raise its dividend in 2016? Another issue at the forefront for Merck shareholders is whether or not the company will boost its dividend in 2016. Merck has boosted its payout in each of the past five years, with the latest increase announced in November 2015. Hopes are high that Merck will once again raise its superior dividend, which is currently yielding 3.5%. This dividend provides strong incentive for income seekers to buy and hold Merck shares over the long-term, which in turn can reduce volatility and help long-term investors sleep better at night. Can Merck deliver a higher payout for the sixth consecutive year? While nothing is for certain, I'd suggest that a nominal increase of $0.01 or $0.02 per quarter is doable. To begin with, Merck's payout ratio and balance sheet would appear to suggest that a modest dividend increase is more than feasible. Merck is currently paying out $1.84 annually, but it's forecast by Wall Street to deliver more than double that ($3.75) in 2016 full-year EPS. A payout ratio below 50% would be conducive to additional dividend hikes. Merck's nearly $27 billion in debt might seem imposing, but in each year between 2010 and 2013 Merck generated $10 billion or more in free cash flow. This is a healthy drug developer that's more than capable of raising its payout based on its cash flow and payout ratio. But the nuts and bolts behind any potential dividend increase will be in the response to Merck's top-line growth. The way I view it, Merck's future dividend increases will fall on the success or failure of three drugs. First, we have Januvia (known as Janumet in overseas markets), a DPP-4 inhibitor that's an absolute juggernaut in type 2 diabetes. Januvia/Janumet will likely lead to more than $6 billion in global sales in 2015, and sales of the drug (exclusive of currency moves) advanced 17% in the third quarter over the prior year. Merck has spent a lot on marketing and physician interactions in order to shore up Januvia's market share, and all signs appear to indicate it's working well. Secondly, Merck is relying on cancer immunotherapy Keytruda to deliver sustainable growth for the next decade and beyond. Immunotherapies work by turning off the immunosuppressant quality of cancer, thus making it easier for your immune system to detect and attack these foreign cells. Keytruda is currently approved for BRAF V600 mutation-positive metastatic melanoma patients and advanced non-small cell lung cancer patients who've progressed on prior therapies and whose tumors express high levels of PD-L1. Merck's management team noted in its Q3 conference call that Keytruda possesses approximately 70% of the high PD-L1-expressing market share in metastatic melanoma, and its response rate in high-expressing PD-L1 patients in advanced NSCLC blew the old standard of care out of the water. Finally, we have Merck's developing hepatitis C program, which is highlighted by its cocktail combination of grazoprevir and elbasvir. Merck's once-daily cocktail drug could become the first once-daily pill to give Gilead Sciences' Harvoni a realistic competitive challenge. Similar to Harvoni, Merck's combo therapy has delivered sustained virologic response rates of 90% or higher in clinical studies. Furthermore, a new cocktail comprised of grazoprevir, MK-3682, and a new version of elbasvir (MK-8408) generated a 91% cure rate in genotypes 1, 2, and 3 in just eight weeks. The HCV market is huge, and Merck looks as if it'll soon have its slice of the pie. Arguably the only thing that could stand in the way of Merck raising its payout in 2016 would be weakness in Januvia. "What might cause Januvia to struggle" you wonder? Look no further than the emergence of SGLT2 inhibitors. Unlike traditional type 2 diabetes standards of care, which work in the pancreas and liver, SGLT2 inhibitors block the absorption of glucose in the kidneys, allowing patients to excrete excess glucose through their urine. Aside from providing improved glycemic balance, SGLT2 inhibitors also led to lowered systolic blood pressure and weight loss. The SGLT2 inhibitor with DPP-4-killing capacity worth watching is Eli Lilly's (NYSE:LLY) and Boehringer Ingelheim's Jardiance. The reason Jardiance could prove a threat to Januvia has to do with the results of its long-term cardiovascular outcomes study, known as EMPA REG OUTCOME. In August, Eli Lilly and Boehringer Ingelheim announced that Jardiance proved superior to the current standard of care in terms of reducing the risk of death. In September Eli Lilly and Boehringer offered more precise data, showing that Jardiance reduced the risk of death by 32% for patients taking the drug. With no other diabetes drug demonstrating this previously, it's possible Jardiance siphons sales away from Januvia in the coming years. Should Merck be on your buy radar? Now to answer the most important question of all: should Merck be on your buy radar in 2016? The potential for Merck to grow its dividend definitely makes it an attractive company worth considering for your investment or retirement portfolio. Further, the rapid growth of Keytruda and the steady growth in Januvia, even following the news on Jardiance, suggests that Merck's operational advance will continue for the time being. This isn't to say Merck is out of the woods completely when it comes to patent loss issues, but Singulair is no longer a concern, and Januvia is looking to be more of a complement than competitor to SGLT2 inhibitors, at least for the time being. Investors looking to add a company with a handsome dividend, low volatility, and strong cash flow to their portfolio could do a lot worse than Merck.